My first job at Microsoft was working on Internet Explorer 4. Prior to that I had done technical support at Spry for their "Internet In A Box" product (before CompuServe bought them). Back then I used a flavor of the Mosaic browser (as did most everyone) and was pretty happy. IE4 was a dramatic change – and I say that as someone who was an expert at the time. It was faster, had more features and was an amazing piece of software. Since 1996 I have tried all of the major browsers when browsing the web for my personal use, and as a software test engineer, I used all of the browsers for the various products and websites I worked on. I even fondly remember the battle between IE and Netscape Navigator. It wasn’t much of a battle, as Netscape was just old and clunky. Fast forward several years and I was one of those geeks who held firmly to Microsoft’s mouse as they released IE5, IE6, IE7 and IE8. By IE8 I felt like they had really perfected the browser. There were lots of great features, it was quick enough and integrated really well into how I used the computer and the web. Then Firefox made the scene. It was faster when loading most web pages and was a big hit among a lot of people – but I held firm to my IE roots and was committed to sticking with it. That is, until Internet Explorer 9. As IE9 rolled out, touting that it was more standards compliant (which I liked) and was the next great browser, I held off on installing it, as I still did a lot of basic web development work and wanted to make sure all the sites I built worked correctly on the browser with the largest market share. Finally, a few months ago, I installed IE9. It was a sad day for me, as I watched years of commitment start to falter. Microsoft had built bloat-ware. Yes, it worked, but it was unbearably slow. I also didn’t like a few other small changes to shortcuts that had been part of IE for years. For over 15 years Internet Explorer was my default web browser when double-clicking on a URL… then, in late November 2011, I clicked that button that says "Make Google Chrome my default browser". It was the end of an era. It honestly makes me sad, but what are my options? More and more websites are focused on supporting Chrome and Firefox. IE9 is incredibly slow when opening new tabs… or just opening for that matter. It frustrates that dragging a shortcut to the desktop creates a "Pinned Site Shortcut", rather than a simple (and easy to edit) URL shortcut. Then, I see this article: "As many as 220 Million users abandoned Internet Explorer in December". I can’t believe I’m so predictable. I’m not one of the millions of iZombies who blindly follow and buy any (and every) new Apple product or who drinks the nobama Kool-Aid, but here, I became one of the MILLIONS of people to finally droped Internet Explorer. For the past month+, I’ve been enjoying the speed and tools in Chrome. 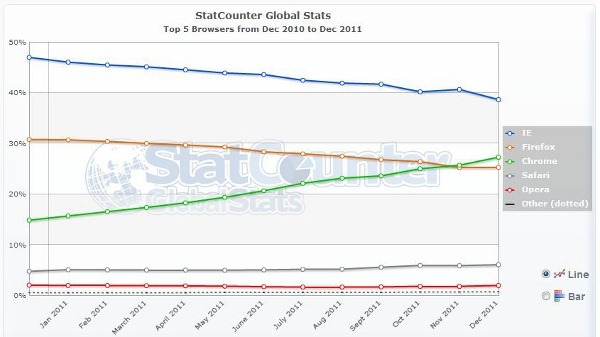 It will be interesting to see what the browser numbers look like at the end of 2012.